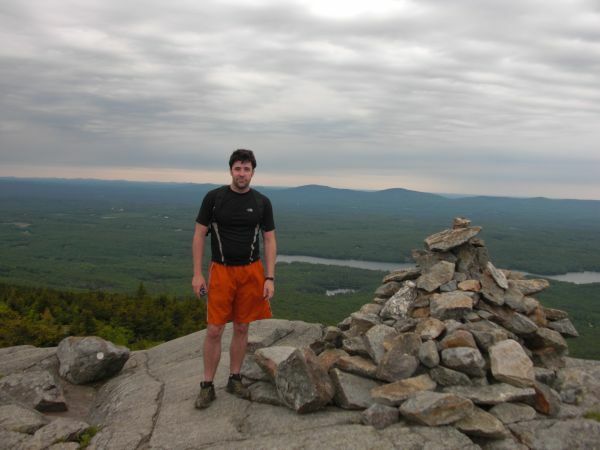 Even though it’s rumored to be the second most-climbed mountain in the world (next to Mount Fuji) and it’s practically in our backyard, Dave and I had never taken the opportunity to climb Mount Monadnock in southwest New Hampshire. With the weekend forecast calling for clear skies and temps in the mid-70s, we decided Sunday would be a great day to experience this popular hike. Monadnock State Park sits only a couple of miles down the road from Jaffrey, NH and is only a short 1.5 hour drive from our home outside of Boston. 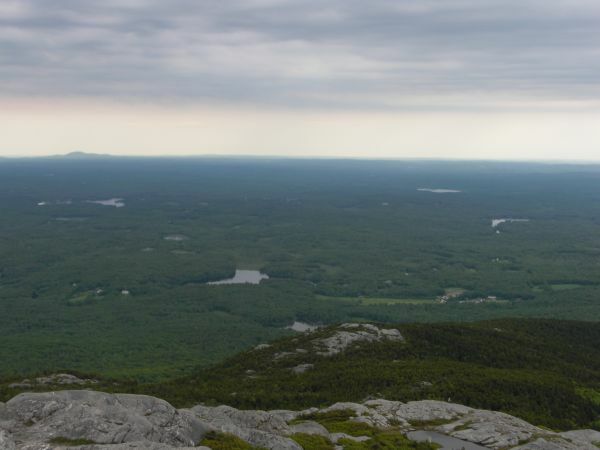 At 3,165’, Monadnock is about half the size of its infamous cousin to the north, Mt. Washington; however, Monadnock’s presence is dramatic, since it’s the only peak within 30 miles that rises above 1,000’. I was surprised to see that when you turn off of Route 124 and enter the state park, Mount Monadnock looms in front of you and makes quite an impression. We arrived at the trailhead just before 3:00 pm – right on schedule. There was a line 3-cars-deep to get into the park, but the rangers were efficient in collecting our $4/person park entry fee, and quickly provided us with a parking pass and a map of the area. And it was nice to see that they also provided a gentle warning about the weather – the radar showed storm systems to the north and south of the mountain. Undeterred, we quickly located a parking space and laced up our boots. We had hoped our later start time would mean thinner crowds. It’s hard to say if this theory held true or not since the parking area and park headquarters teemed with people. But I imagine it’s a downright zoo at 10:00 in the morning. 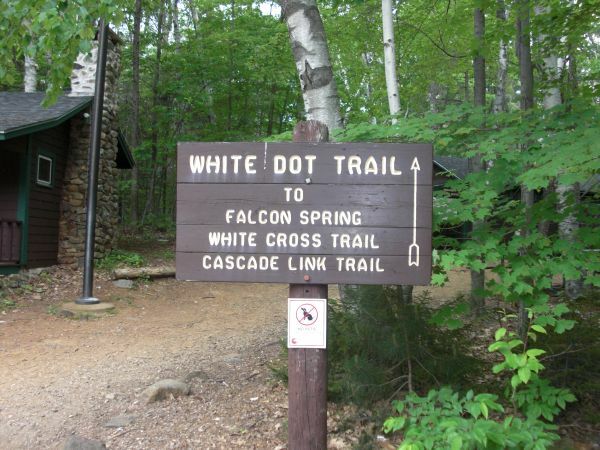 Our plan was to do a 4-mile loop – up the White Dot Trail and down the White Cross Trail. This is by far the most popular route on the mountain, since it’s only 2 miles to the summit and offers stunning views not too far in. At 3:00 sharp we started up the trail, along with at least 2 other groups. The trail was well-groomed and wide – and a veritable highway of people. I lost count of the number of groups coming down as we were going up. Nevertheless, it was nice to see so many people out enjoying the day. After about .5 miles the trail steepened considerably. 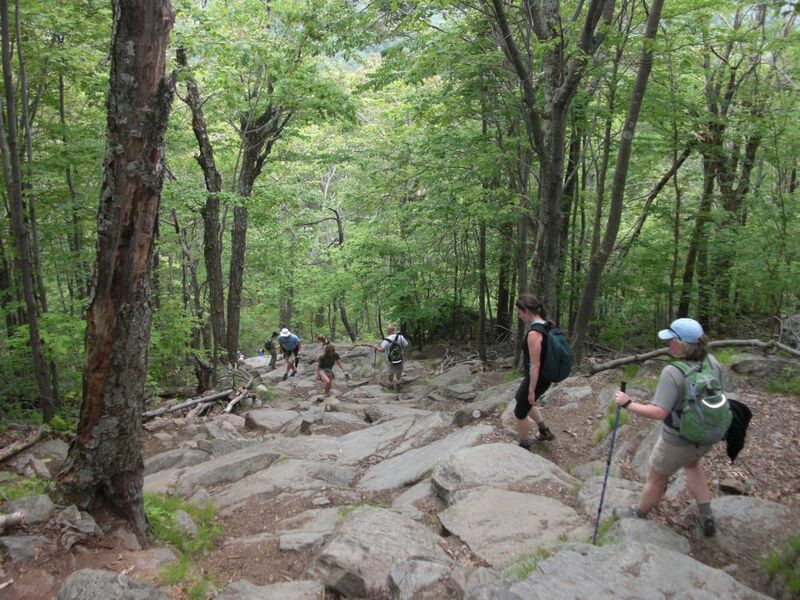 Although Monadnock is not part of the White Mountains, it sure provided the typical White Mountain trail experience – lots of fun scrambles over steep granite outcroppings. Good times! Several natural rest areas provided great views and after about 50 minutes of steady climbing we found ourselves above treeline. At around 4:15 we reached the summit. The wind had picked up a bit, so we only lingered for about 20 minutes before beginning our descent. We made our way down the White Cross Trail, which proved to be much easier than the White Dot Trail. Fewer scrambles allowed us to make good time and we found ourselves at the parking area at 5:30. Despite the amount of traffic these trails get, Dave and I were very pleased that we did not see a single piece of trash strewn about and the trail erosion, though noticeable, could have been much worse. I certainly wouldn’t recommend this hike for a remote wilderness experience, but it was perfect for an afternoon away and succeeded in getting us “out there” for the first time this summer. We’ll be back! 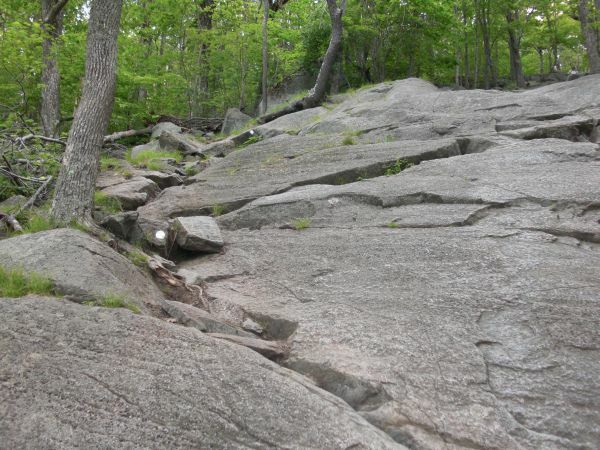 Difficulty: Above average, with a few steep sections and scrambles. Directions from Boston/Arlington area: Follow Route 2 West about 50 miles to Exit 24B. Merge onto Route 140-W and continue for about 9.5 miles. Stay straight to continue on MA-12 North/Spring Street. After 1.5 miles, turn right onto Glenallen Street and continue for 3 miles (entering NH). Continue on US 202 for 7.5 miles. Turn left at Main Street/US-124. After 4 miles, turn right at Monadnock State Park. Follow the signs to park headquarters.